Being a girl, I know how much I value my hair. By putting my feet into the shoes of a cancer patient, I can only imagine how hard and traumatising it must be to deal with everything. Losing hair completely is almost like losing my self-esteem and it is probably the same for all. Therefore, on hearing that hair can be donated, I immediately made up my mind to do so on my birthday. Finally, after inquiring about wig makers and the procedure, I cut about 18 inches of my hair. Now that my cascade is in the making of a wig, I love my blunt hair cut. It makes me feel really great that I was able to do this. 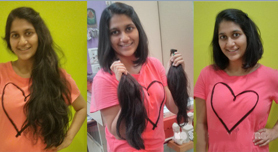 Since initially few people knew about my donating hair, when everyone saw me, I was asked questions like “Where’s the rest of you?” And to their surprise when I told them what I had done they were all so proud of me. I feel grand that so many people wished me well and felt like a much better human being on contributing little that I could. I have been given so many blessings from friends, family, family of friends as well as friends of family.